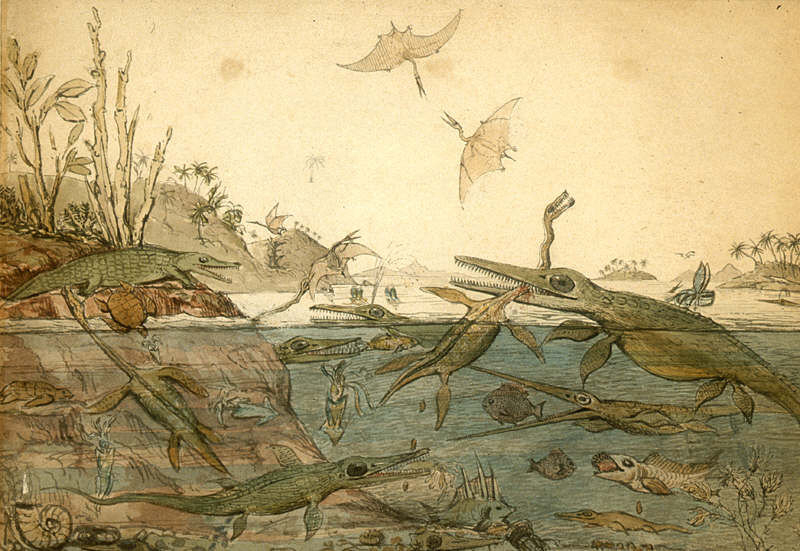 Duria Antiquior - A more Ancient Dorset is a watercolour painted in 1830 by the geologist Henry De la Beche based on fossils found by Mary Anning, and was the first pictorial representation of a scene from deep time based on fossil evidence. In the Mesozoic, the time of the dinosaurs, from 252 to 66 million years ago, marine reptiles such as ichthyosaurs and plesiosaurs were top predators in the oceans. But their origins and early rise to dominance have been somewhat mysterious. New research published this week in the journal Paleobiology by palaeobiologists from the University of Bristol shows that they burst onto the scene, rather than expanding slowly into their ecosystems. The new research uses the rich fossil record of Mesozoic marine reptiles to statistically quantify variation in the shape and function of their jaws and teeth. Up to now, studies had been based mainly on estimates of their biodiversity, or number of species, through time. The new study explores the range of shapes and sizes, and ties characters of the shape of the jaws and teeth to modes of life, including their specialised modes of feeding. Intriguingly, just 30 million years after the initial marine reptile “evolutionary burst”, they were hit by a number of extinctions in the Late Triassic, which wiped out most groups. The new research shows that these extinctions removed many specialized niches and morphological adaptations, and had long-lasting effects on marine reptile evolution.